The Australian Industry Group wants the Government to increase the immigration intake from 190,000 this financial year to 220,000 in 2014-15, with a particular focus on skilled migrants. Ai Group chief executive Innes Willox says now is the right time to accelerate skilled migration given Australia’s ageing workforce and skills shortages in industries including mining, construction, engineering and health. The short-termism on display across Australia never ceases to amaze. Instead of addressing skills shortages head-on via increasing education and training of the local workforce, the AIG is seeking to band-aid over the issue via ramping-up migration – which is already running at twice the long-run average level (see next chart) – even further! 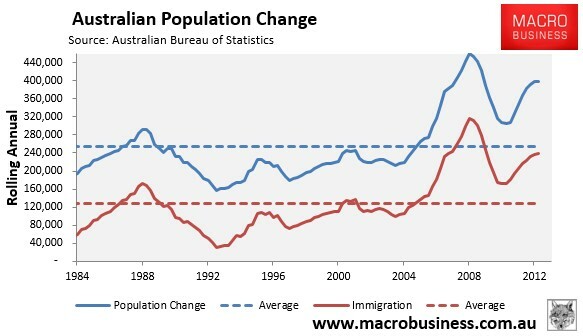 Never mind the fact that such immigration would worsen Australia’s already large infrastructure deficit and risks lowering living standards for the pre-existing population, or that high population growth cannot alleviate the effects of an ageing population anyway. No, this is classic rent-seeking behaviour by the AIG aimed squarely at lowering labour costs, with the broader community footing the bill indirectly via increased congestion, higher housing/utilities costs, and overall worsening living conditions. Is anyone aware of politicians speaking out against the lunacy? The only one I’m aware of is Kelvin Thomson. It is astonishing that the Australian Industry Group is calling for an increase in Australian migration from 190,000 to 220,000, through an increase to our permanent Migrant Worker Program. First it is astonishing that they think the number should be lifted by 30,000, when as recently as twenty years ago the entire permanent Migrant Worker Program was less than 30,000. Secondly it is astonishing that they want to increase the number of migrant workers when we are already unable to find jobs for Australian workers, including those who have come here on previous permanent Migrant Worker Programs. Last month unemployment increased by 3,400 to 712,500 Australians who cannot find work, and this number is forecast to increase. Official forecasts are that the jobless rate will rise within about 18 months to 6.25%, and stay there through to the end of 2016-17. More Australians will be out of work than at any time during the past decade, and far more than during the Global Financial Crisis. The forthcoming closures of Ford and Holden, job losses at Qantas, concerns for jobs at SPC Ardmona and Alcoa, the resources industry construction workforce winding back – all the indicators are that many Australians, including migrant workers, are looking for work or will be looking for work in the near future. They are entitled to our first consideration. The Australian Industry Group says that increasing migrant numbers is needed to “support positive growth in our population”, and refers to relatively low levels of natural population growth. This is incorrect. For each of the past thirty-six years I have gone back to check this, births have exceeded deaths in Australia by over 100,000 – we have natural population increase by over 100,000 every year without any migration at all. In any event, population growth is not a good thing. It is putting great pressure on our environment, quality of life, housing affordability, traffic congestion etc. The permanent Migrant Worker Program, referred to as “Skilled Migration”, should be used to bring workers with skills that it is not possible to find in Australia, not used as a catch all scheme – recently we even saw calls to bring in truck drivers from overseas. It should not be used to drive population growth, not used to put downward pressure on wages and conditions, and not used as a substitute for genuine action to train and skill young Australians. If we are fair dinkum about reducing unemployment, and fair dinkum about increasing workforce participation, we will reduce migrant worker programs, not increase them, and build and use the skills of out-of-work Australians. You should ask for (and get) equal time from the ABC. Wow. I must start following Kelvin. Have you got a link to his site? Kelvin Thomson has been banging on about population for 4-5 years now. He probably belongs in the Greens. BTW Leith, when is old grumble bum back? I thought it was this week. The UK has opted for that as a growth strategy and their press reported smugly how they would overtake France with such a policy. AIG is an intellectually moribund organisation. A parrot would be just as effective. Well, someone had to do it! Unbelievable. With all our infrastructure groaning under the highest migration we’ve ever seen, these clowns think more population ponzi is what we need. It would be nice if they just took the time to read some of the analysis by UE before serving up this garbage. I don’t know how other people felt about this but i squawked a tirade of abuse at my radio. Time to take our institutions back from the thoughtless unfettered growth obsessed fools that have delivered us nothing but high migration and public/private asset sales to foreign entities. Definitely in the technical trades, 457’s are just plain cheaper. Reminds me of how, about a decade ago, the Australian Computing Society (ACS) was publicly against the practice of replacing local programmers with 457 visa’s. Then something happened behind closed doors – the ACS became part of the assessment process. After this and ever since, the ACS has been all over the media asking for more visa’s, complaining about the skills shortage. This is the business of Australia’s Immigration. I worked with a firm for a while doing these 457’s and easily at least 50% (probably closer to 75%) were just scamming to get cheaper labour (often a compatriot where there was an under the table deal on salary) or just someone they didn’t need to train. And this wasn’t with a two bit migration firm, this was with a top-tier consulting firm. In truth land the ‘457 visa’ is better known as the ‘can’t be f.d training an Australian visa’. It is well-documented that there is a huge shortage of ICT graduates, so where else are consultancies going to look than 457s? The irony of this is that one of the reasons that graduates are not choosing to study IT is because of the perception that there will be no jobs due to 457s / outsourcing. This is simply not the case, its just misunderstandings all round. What there WONT be is continual growth of technical IT jobs (coding, infrastructure) because these are too easily offshored. But theres desparate need for more IT management talent. Most companies end up using too many third parties to fill these roles as they cant find talent to bring up into these positions. Australia’s corporates are primarily foreign owned, they have no interest in training young Australians, it costs money and it makes them uncompetitive. There is not a shortage of graduates, there is a shortage of businesses that can be bothered investing in their people, because they can always outsource or go 457ing. The 457 visa is part of the problem, not the solution. “number of grads completing an ICT course fell 53% from 2003 to 2010”. Apparently there is a similar issue in engineering. Working in the industry I can tell you that companies would absolutely take more grads if they could get them. Not only that, the competition for positions is surprisingly low, its a sellers market. Companies the world over have an interest in availability of skilled labour in the places they choose to operate. Its vital that Aus takes steps to improving its IT skillbase (amongst others) or companies will up-sticks. Aus also needs to lower its costs (wages). As a worker, I dont lke this but it is inevitable particularly at current AUD levels. Once again Importing Welfare through immigration fed population growth policies. I have noticed the Centrelink lines growing even with streamlined services framework. The Australian Government cannot afford it (increased migration) on the welfare entitlement bill but their ideological agenda is more powerful than this rational fact. Evidence also points to the urgency in turning back the refugee boats, the government cannot afford the welfare bill later but will implement it’s draconian human rights policies at any cost to the taxpayer now. Just part of the Liberal National Party (LNP) attack on wages or focus on wage deflation, only way to do it is to bring in 457 visas and pay them less with worse conditions than a citizen is entitled to. Bottom line these bottom feeders who call themselves the Australian Government are eroding our quality of life, eroding our permanent skills base, eroding work welfare and quality of work for their short term ideological policy agenda. Tony Abbot the one hit wonder man wants to be known and written into the history books as the man who smashed wages in Australia and brought productivity and competitiveness back to the Australian labour market. It all starts and ends with the Australian Government and who they represent. Growth in migration agents registered year to Sep 2013? Australia is little America with its mindless aping of the same useless policies including labour arbitrage. @The Lorax “Kelvin Thomson has been banging on about population for 4-5 years now. He probably belongs in the Greens.” The Greens have no population policy. http://greens.org.au/policy. Apart from the wonderful Kelvin, the only party addressing population is the Sustainable Population Party. http://www.PopulationParty.org.au . Everyone had the opportunity to support them in the Senate at the last federal election. Perhaps they’ll have more luck at the Griffith by-election and the WA senate re-run. I see so many kids of my children’s generation who are smart, willing, capable and “can do” if only someone would give them a chance. Instead they are working in supermarkets as checkout chicks or stacking shelves. This is a long term opportunity cost to the whole of society. Clever country or short term expediently foolish one?